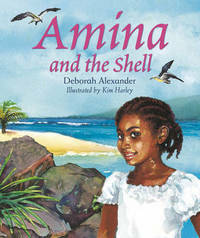 Amina and her family live in a beautiful lush valley on a tropical island. After yet another storm ruins their vegetable garden, Amina finds a tunnel through the debris to the other side of the mountain, where giants live. As soon as she arrives, amina has her first encounter with the giants. One of them picks up the beautiful shell she is hiding in and carries it off. She needs the help of some clever mice to escape and returns home with a gift for her parents. tropical fairy tale. Deborah Alexander taught in primary schools for seventeen years before moving to France where she combines her teaching and writing activities with working in a local estate agency. She currently writes for 'Le 66', an English-language magazine based in the Pyrenees Orientales, whilst working on her children's stories. She bases her stories on her experience of working with children over the years.